When your little one is old enough to move onto solids, you have two options. You can either buy store bought baby food, or make it yourself. There are pros and cons to both options and it helps to understand each of them before you make a decision. There are a lot of reasons many mothers choose to make their own baby food and it is quickly becoming a popular preference as time goes on. So, what are the benefits of making baby food yourself? You Know Exactly What’s Going Into Your Little One’s Food – If you’re cautious about what goes into your little one’s tummy, making your own baby food gives you great peace of mind. When you make it, you know exactly what’s in it and you don’t need to worry about potentially nasty ingredients such as preservatives. You can also ensure it contains the right level of nutrients your little one needs to stay happy and healthy. You Control The Flavor – Creating your own baby food also gives you a lot more control over what you feed your little one. When you buy it from a store, you have no input into the flavors and types of fruits and vegetables that are included. Avocados and melons for example are rarely included in manufactured baby foods. It Can Help Avoid Future Mealtime Battles – Many parents struggle to get their children to try healthier foods during the toddler years. This is largely because the child has never experienced the flavors presented to them so they are reluctant to put anything in their mouth they don’t know will taste good! Mashing up foods such as broccoli, avocados and strawberries into your baby’s food will get them used to these flavors early on and therefore reduce those dreaded toddler mealtime battles. It Can Be More Affordable – While this isn’t always the case, making your own baby food can be a more budget-friendly option. Provided you have the right equipment and you shop around, it can prove to be a lot cheaper to create your own food than it is to buy it ready-made. So, if you’re on a tight budget, homemade baby food might be the way to go. So, those are the benefits but what about the cons? The main disadvantage is obviously the time it takes to create the food. Some may argue it doesn’t take long and the benefits far outweigh the inconvenience. However, not all parents have the luxury of time. Each parent’s situation is different. Some are stay-at-home parents, while others can’t afford to give up work so they rely on babysitters and find themselves with very little time on their hands. Even stay-at-home parents don’t always have extra time to spend making their own baby food. So, it all depends upon your situation and whether it is possible to find the time to make your own food. Another potential disadvantage is that fresh homemade baby food doesn’t store for long. So, you will need to make it frequently and it can’t always be made in bulk depending upon the ingredients used. As you can see, there are definitely more advantages than disadvantages when it comes to homemade baby food, so what about store-bought brands? It’s Convenient And Easy To Find – Convenience is the biggest reason parents often choose to stick to store bought baby food. Practically all grocery stores sell it, which means if you’re travelling it’s easy to find and stock up on the baby food you need. There’s practically no preparation required, which makes it great for busy parents who struggle to find enough hours in the day. It Can Be Stored For Long Periods Of Time – Unlike homemade baby food, store bought varieties often come with a long shelf life. They don’t usually need to be refrigerated either so it won’t take up too much space. You’ll never need to worry about running out or about having to throw it away after a certain amount of time. It Can Be More Cost Effective – While homemade baby food can be a less expensive option in the long-term, you do need to ensure you have the right equipment and the ingredient can be expensive. So, if you don’t have the right equipment at your disposal, it may actually be cheaper to continue buying store-bought food. When you weigh up the cost of homemade versus store-bought baby food, in the short-term store bought is more affordable. However, its long term costs do tend to work out more expensive. Perhaps the biggest worry for parents however, is that store-bought baby foods do contain preservatives and can lack nutrients compared to homemade fresh food. The preservatives are responsible for the long shelf-life and aren’t very healthy for baby. Obviously, they are safe, as if they weren’t stores wouldn’t be allowed to sell them. However, some parents are reluctant to give their little ones anything containing preservatives. The fact store-bought foods have a different taste is also a potential concern when it comes to transitioning to fresh foods later on. Your toddler may be extremely reluctant to eat fresh fruits and vegetables if they are unfamiliar with the taste. 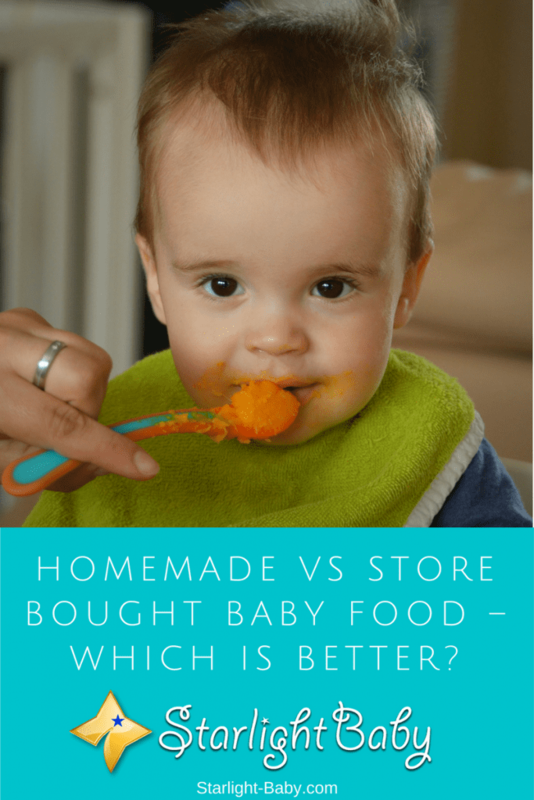 So, when you compare the pros and cons to store-bought and homemade baby foods, it’s easy to see homemade does appear to be the better option much of the time. The key thing to remember is that there is no right or wrong choice. As a new parent, you’re often inundated with opinions of what you should and shouldn’t be doing. While homemade baby food can be the better option in terms of nutrient content, for some mother’s it just isn’t possible to set aside the amount of time required to make your own baby food every day. So, do what’s right for you and if you can find the time to make your own, try it. Homemade is often recommended, but it certainly isn’t essential. Nicely presented both the positives and negatives of each food. Me and my partner sort of used both. We sometimes bought the baby food from the grocery shop but we always made sure that it’s the high-quality one – the bad side is that those premade kinds are usually really expensive. Other times, we made the baby food ourselves. It isn’t that hard at all. You have plenty of good food ideas and recipes on different sites and forums. We also ended up buying one of that baby-food makers that does everything you need for the food to be prepared for him/her. It isn’t a bad investment if you consider how much time it can save you. Whatever you choose to do, don’t worry about it. You really shouldn’t feel bad if you don’t have enough time to always home prepare the baby food and have to resort to premade type. Just do some research on which brands are the quality ones. We have different schedules in our daily life. As much as possible, parents would love to give everything to their kids prepared or specially made by them. There are some cases that we really have no time and just go to convenient stores to grab what we need. Foods for babies are very delicate to handle. The way how to prepare and prevent from any harmful microorganism, the handling of food is so important. This is the fastest way of transmitting bacteria or viruses through food. If mothers are not working at office or really a full time mom, they have enough time to make or prepare food for babies but for working mom’s it’s more convenient for them to just buy. Whatever the case is we have to aware and follow the instructions on what the baby can eat according to age. A few days ago, we began feeding solid food to our baby. We started with lentil soup. We boil lentil until it is soft and tender, then mash it properly add some salt and feed the baby. In few weeks, we will be feeding rice. We will boil rice thoroughly and then smash it and feed the baby. I think I will not buy baby food from the store. I don’t know what’s inside this food and how healthy it is for baby. However, I know what I am feeding when I am feeding homemade food to the baby. There are definitely going to be mixed opinion about homemade baby food and store bought ones, but personally in my opinion, as much as homemade baby food looks more promising, parents certainly can’t do without buying from stores as well. The question here is how often should a parent rely on either homemade baby foods or buying from stores. From where I stand, I think how the baby react to each food should be the deciding factor in picking one more over the other. So it’s left for the parent to keep a close eye on their baby’s feeding habit to decide which kind of food to give the child.